Cisco Systems, Inc. (NASDAQ:CSCO) was in 55 hedge funds’ portfolios at the end of December. CSCO investors should be aware of a decrease in hedge fund sentiment lately. There were 58 hedge funds in our database with CSCO holdings at the end of the previous quarter. Our calculations also showed that CSCO isn’t among the 30 most popular stocks among hedge funds. We’re going to take a glance at the recent hedge fund action encompassing Cisco Systems, Inc. (NASDAQ:CSCO). Heading into the first quarter of 2019, a total of 55 of the hedge funds tracked by Insider Monkey were long this stock, a change of -5% from the previous quarter. 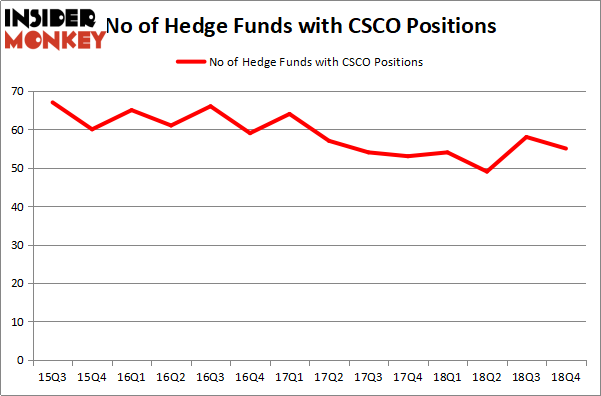 The graph below displays the number of hedge funds with bullish position in CSCO over the last 14 quarters. With the smart money’s capital changing hands, there exists a few notable hedge fund managers who were increasing their stakes considerably (or already accumulated large positions). 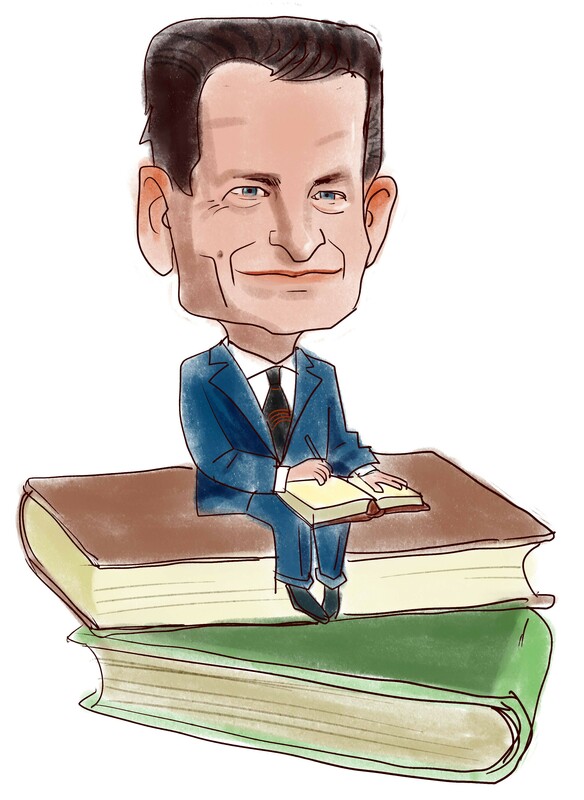 When looking at the institutional investors followed by Insider Monkey, Ken Fisher’s Fisher Asset Management has the largest position in Cisco Systems, Inc. (NASDAQ:CSCO), worth close to $1.1846 billion, accounting for 1.6% of its total 13F portfolio. Coming in second is AQR Capital Management, managed by Cliff Asness, which holds a $597.6 million position; the fund has 0.7% of its 13F portfolio invested in the stock. Other hedge funds and institutional investors with similar optimism encompass Donald Yacktman’s Yacktman Asset Management, Noam Gottesman’s GLG Partners and Phill Gross and Robert Atchinson’s Adage Capital Management. Seeing as Cisco Systems, Inc. (NASDAQ:CSCO) has witnessed falling interest from the aggregate hedge fund industry, it’s easy to see that there were a few hedge funds who sold off their full holdings heading into Q3. At the top of the heap, Jim Simons’s Renaissance Technologies dumped the largest stake of the “upper crust” of funds followed by Insider Monkey, valued at close to $99.7 million in call options. Mike Masters’s fund, Masters Capital Management, also sold off its call options, about $48.7 million worth. These moves are intriguing to say the least, as aggregate hedge fund interest dropped by 3 funds heading into Q3. Let’s now take a look at hedge fund activity in other stocks similar to Cisco Systems, Inc. (NASDAQ:CSCO). These stocks are The Home Depot, Inc. (NYSE:HD), Taiwan Semiconductor Mfg. Co. Ltd. (NYSE:TSM), The Boeing Company (NYSE:BA), and Toyota Motor Corporation (NYSE:TM). This group of stocks’ market valuations are closest to CSCO’s market valuation. As you can see these stocks had an average of 42.5 hedge funds with bullish positions and the average amount invested in these stocks was $3039 million. That figure was $3239 million in CSCO’s case. The Boeing Company (NYSE:BA) is the most popular stock in this table. On the other hand Toyota Motor Corporation (NYSE:TM) is the least popular one with only 8 bullish hedge fund positions. Cisco Systems, Inc. (NASDAQ:CSCO) is not the most popular stock in this group but hedge fund interest is still above average. Our calculations showed that top 15 most popular stocks among hedge funds returned 19.7% through March 15th and outperformed the S&P 500 ETF (SPY) by 6.6 percentage points. Hedge funds were also right about betting on Cisco as the stock returned 23.7% and outperformed the market as well.